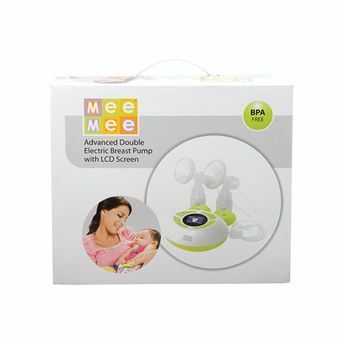 Breast feeding mothers can now express faster, in an easier manner and in more comfort with Mee Mee's Advanced Double Electric Breast Pump. This innovative expressing system enables mothers to express both breasts simultaneously. Five speed and suction settings help in controlling the power and vacuum levels, as per the needs and comfort of the mom. The LCD screen displays the level of suction and speed, especially useful while expressing in a dark room or in dim lights at night. The rhythmic suction and speed enable the mother to express faster, stimulate the galactophore and eases the milk flow while pumping. Overall, this advanced system saves time, expresses more and makes pumping a smooth and hassle free experience for all nursing mothers on a daily basis and even while traveling. Allows mothers to express milk from both breasts simultaneously, provides complete comfort and expresses more milk in less time. All parts of this pumping system are made from BPA free, soft silicone materials and propylene plastic that are non-toxic. Classic piston pump system mimics babies' natural sucking motion, making expressing very comfortable experience for mothers. The pumping system has a two phase function where it stimulates milk production and helps in expression through suction and speed.